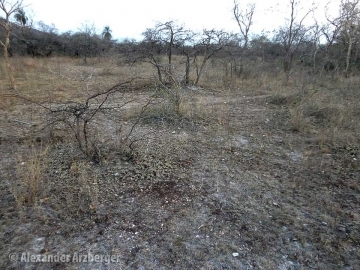 Origin and Habitat: East of Porto Murtinho, North of Rio Apa, Mato Grosso del Sur, Brazil. Altitude range: 120-145 metres above sea level. Habitat and ecology: Frailea cataphracta subsp. melitae grows in partial shade, under bushes and small shrubs together with Gymnocalycium damsii, Echinopsis spec., Harrisia bonplandii, Cereus kroehnleinii, Cleistocactus baumanii and Stetsonia coryne. 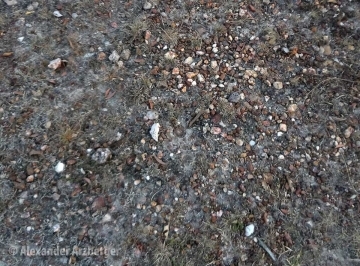 The substrate is clayey and fairly compact. This species previously believed extinct was fortunately found again, in multiple locations and in large number. 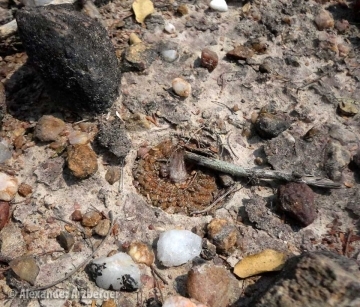 The reason for such belief is due to the fact that often in habitat, during the dry season the small plants are not found, because they are completely buried in the ground and almost invisible. 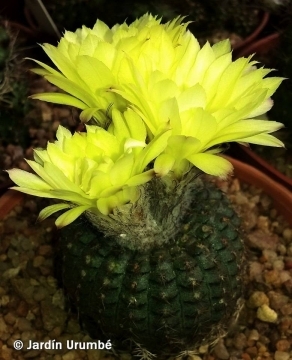 Description: Frailea cataphracta subsp. melitae (firstly described as Frailea melitae by Buining & Bredero in 1974) is a local or morphological form of Frailea cataphracta subs. duchii. 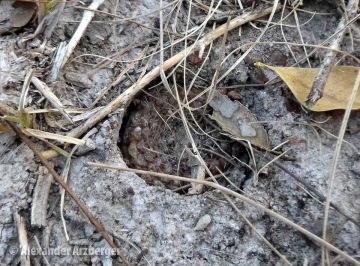 It has less than 21 flattened, but noticeably tuberculate ribs (in subsp. duchii the ribs are less than 18). However the distinguishing characteristics of subsp. melitae, appear to fall within the natural variation of subs. 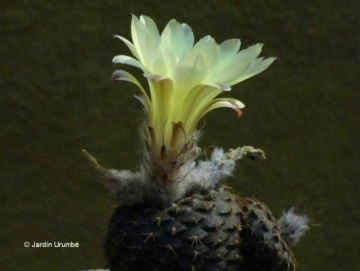 duchii, and the two plants are not readily distinguishable, if not for the geographical provenance. More likely they are one and the same species. 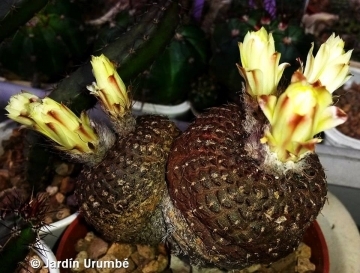 Derivation of specific name: This member of the Cactaceae family was given this name for Melita Horst, wife of the Brazilian plant collector Leopoldo Horst. Stem: Solitary, not clumping, globular, rootstock conical sunk into the earth, 1.5 cm tall and to 4 cm in diameter, dark olive-green to brown or purplish. Ribs: Up to 21, quite flat divided by transverse depression into tiny tubercles, darker V-shaped , blots can be seen below the areoles. Areoles: With conspicuous, glassy white wool, later glabrous. Spines: Thin, straight, glassy white, a little stronger and light brown at the base, deciduous or persistent. Radial spines pectinated up to 4 on each side, 3 to 4 mm long, at times with a small central spine 3 mm long. Flowers: Funnel-shaped, 27 mm long and up to 37 mm wide when open, shiny golden yellow. Corolla tube, with tawny hair and up to 8 mm long bristles overgrowing the receptacle. Inner wall of the receptacle red at the base, outer receptacle wall covered with scales, bristle and hair. Petals, golden yellow, spathulate, pointed at the ends, upper margin finely notched. Style white. Stamens white, red in the lower part. Anthers yellow. Fruit: Fruits 9 mm long, 8 mm wide covered by light yellow bristles and white hairs. Seeds: Cap-shaped, 2 mm long and 1.5 mm wide, smooth and shiny, brown. 3) Pierre J. Braun en Eddie Esteves Pereira. 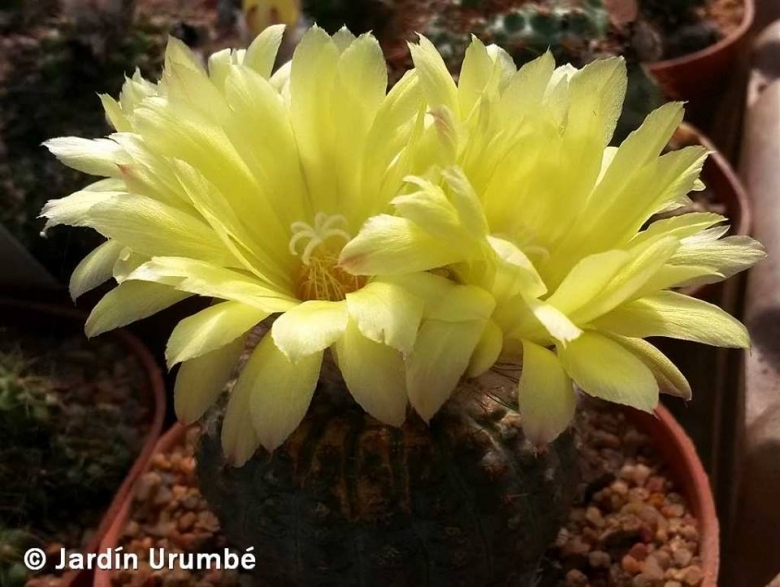 “Nieuwe combinaties en namen voor cactussen uit Brazilie, Bolivia en Paraguay.” in Succulenta (Netherlands) 74 (3): 130-135, 1995. Cultivation and Propagation: Frailea melitae is a summer grower species relatively easy to grow. It is sometime seen as a grafted plant but grows very well on its own roots too. 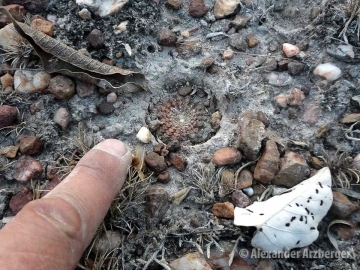 Characteristically, during the dry season plants retract completely under the ground both in the wild and in cultivation too. Watering: Requires careful watering to keep plant compact. Water sparingly from March till October, the thin, fibrous roots suffer if there is humidity, therefore the plant should be watered only when the surrounding terrain is dry. Keep dry as soon as the temperature starts dropping in October and keep it perfectly dry in winter at temperatures from 5 to 15 degrees centigrade. High nocturnal humidity promote growth.